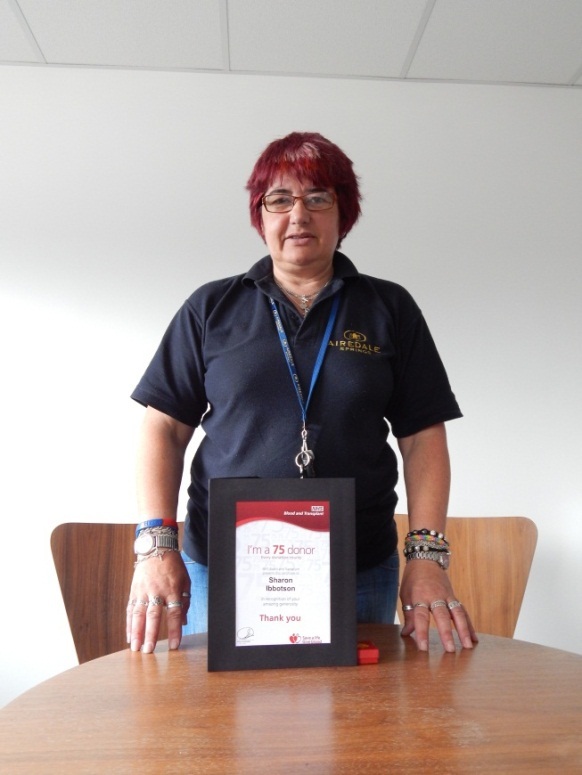 Last month Sharon Ibbotson received a very prestigious award from the Blood Donation Service. Since starting at the age of 18 Sharon has donated a grant total of 75 pints of blood and has received a certificate and badge in recognition of her service. Sharon was encouraged to start donating by her sisters and she strongly believes everybody should do it. Currently only 4% of adults donate blood and each donation can help up to 3 people. For more details on blood donation go to http://www.blood.co.uk. When not at work Sharon spends her time on the family farm tending to her beef cattle, pigs and sheep. Though Sharon in our Company Buyer, she and her family help out in a number of other ways including using all our waste shredded paper as bedding for her pigs and her brother John uses our waste wood for making or repairing pig shelters or burning on the range. Sharon has been with Airedale Springs for 37 years and is an inspiration to others who want to give something back to the community.